It has been proposed that the cerebellum acquires internal models of mental processes that enable prediction, allowing for the optimization of behavior. In language, semantic prediction speeds speech production and comprehension. Right cerebellar lobules VI and VII (including Crus I/II) are engaged during a variety of language processes and are functionally connected with cerebral cortical language networks. Further, right posterolateral cerebellar neuromodulation modifies behavior during predictive language processing. These data are consistent with a role for the cerebellum in semantic processing and semantic prediction. We combined transcranial direct current stimulation (tDCS) and fMRI to assess the behavioral and neural consequences of cerebellar tDCS during a sentence completion task. Task-based and resting-state fMRI data were acquired in healthy human adults (n = 32; μ = 23.1 years) both before and after 20 min of 1.5 mA anodal (n = 18) or sham (n = 14) tDCS applied to the right posterolateral cerebellum. In the sentence completion task, the first four words of the sentence modulated the predictability of the final target word. In some sentences, the preceding context strongly predicted the target word, whereas other sentences were nonpredictive. Completion of predictive sentences increased activation in right Crus I/II of the cerebellum. Relative to sham tDCS, anodal tDCS increased activation in right Crus I/II during semantic prediction and enhanced resting-state functional connectivity between hubs of the reading/language networks. These results are consistent with a role for the right posterolateral cerebellum beyond motor aspects of language, and suggest that cerebellar internal models of linguistic stimuli support semantic prediction. SIGNIFICANCE STATEMENT Cerebellar involvement in language tasks and language networks is now well established, yet the specific cerebellar contribution to language processing remains unclear. It is thought that the cerebellum acquires internal models of mental processes that enable prediction, allowing for the optimization of behavior. Here we combined neuroimaging and neuromodulation to provide evidence that the cerebellum is specifically involved in semantic prediction during sentence processing. We found that activation within right Crus I/II was enhanced when semantic predictions were made, and we show that modulation of this region with transcranial direct current stimulation alters both activation patterns and functional connectivity within whole-brain language networks. For the first time, these data show that cerebellar neuromodulation impacts activation patterns specifically during predictive language processing. Multiple lines of evidence suggest that the cerebellum is involved in a variety of language-related functions, including verbal working memory, language learning, semantic processing, and word retrieval and generation (for review, see Mariën et al., 2014; Mariën and Manto, 2015). Cerebellar activation during articulation localizes medially to bilateral lobule VI (Frings et al., 2006); nonmotor components of language primarily engage lateral right lobules VI and VII (Frings et al., 2006; Stoodley, 2012), consistent with the contralateral projections between the cerebellum and cerebral cortex. Although traditionally cerebellar damage has been associated with dysarthric speech, posterolateral cerebellar damage can result in a range of language deficits, including impaired naming, verbal fluency, verb production, grammaticality of speech, word stem completion, and syntactic comprehension (Schmahmann and Sherman, 1998; Limperopoulos et al., 2007; Bolduc and Limperopoulos, 2009; Mariën et al., 2014). Further, such language deficits can exist even in the absence of dysarthria, which typically results from damage to the cerebellar regions (medial lobule VI) that are engaged during articulation (Fiez et al., 1992; Schmahmann and Sherman, 1998; Timmann et al., 2008). This motor/nonmotor distinction is consistent with cerebellar functional topography: anterior lobe regions associated with articulation and dysarthria interconnect with somatomotor networks, whereas posterolateral regions associated with higher-level linguistic processing interconnect with prefrontal and parietal association cortices (Stoodley and Schmahmann, 2009; Buckner et al., 2011). More specifically, the cerebellum connects with regions that are active during language learning and syntactic and semantic processes, including the supramarginal gyrus (SMG), medial superior frontal gyrus (SFG), left inferior frontal gyrus (IFG), left middle temporal gyrus (MTG), and the precuneus (Callan et al., 2003; Binder et al., 2009; Price, 2012). During semantic processing, activation in these networks is thought to reflect the representation and use of both concrete and abstract concepts and the grammar needed to combine them into sentences (Shallice and Cooper, 2013). Although the cerebellum is clearly involved in language, the specific contribution of the cerebellum to language networks and language processing remains an open question. Recent models suggest that cerebrocerebellar connections are important in phonetic aspects of speech motor production, consistent with the established role of the cerebellum in sensorimotor control (Hickok, 2012). It is theorized that the cerebellum creates internal models of movement, updating these models based on sensory feedback and comparing the actual outcome with the intended one (Ito, 2002). The ability to create and update internal models results in efficient predictive processing and could contribute to error monitoring and fluency during speech production and comprehension (Pickering and Garrod, 2007; Hickok, 2012). Because it is thought that similar computations are performed throughout the cerebellar cortex, the motor literature provides a framework and testable hypotheses for understanding the role of the cerebellum in nonmotor aspects of language (Ito, 2008). Hence, it has been proposed that the cerebellum may support the formation of internal models during linguistic predictive processing (Argyropoulos, 2016; Miall et al., 2016; Moberget and Ivry, 2016), which could be critical for the optimal performance of a range of high-level language functions. Because the right posterolateral cerebellum forms reciprocal circuits with cerebral cortical language regions, it is a potential anatomical substrate of predictive language processing (Moberget and Ivry, 2016). Here we assessed the role of the cerebellum in semantic prediction by harnessing the power of combined transcranial direct current stimulation (tDCS) and fMRI. Before and after tDCS to the right posterolateral cerebellum, we acquired neuroimaging data while participants performed a sentence completion task, during which the sentence context modulated the predictability of the target word. We aimed to determine whether the cerebellum is part of the predictive language network, and to investigate the effects of cerebellar modulation on neural activation patterns and functional connectivity in this network during sentence processing. We hypothesized that the cerebellum would show unique patterns of activation during highly predictive sentences, reflecting an acquired linguistic internal model, and that cerebellar tDCS would specifically modulate behavioral performance and neural activation patterns during predictive sentences. Thirty-five healthy young adults (12 males, 23 females; 23.7 ± 2.7 years of age) provided written, informed consent to take part in the study, which was approved by the Georgetown University Medical Center Institutional Review Board. Participants were compensated $60 for their time (∼1.5 h). All participants were right-handed, native English speakers, with no history of neurological injury, psychiatric or developmental disorder, and no contraindications for tDCS or MRI. Participants were blinded to the stimulation conditions and randomly assigned to either the sham (n = 15) or the anodal tDCS (n = 20) group. One anodal participant was excluded from all analyses because of scanner artifact unrelated to the current experiment. Because of technical difficulties during language task administration, two participants (n = 1 anodal; n = 1 sham) were excluded from language task analyses, and these participants' data were only included in the resting-state analyses. Therefore, predictive language task data were available for 32 participants (n = 18 anodal; n = 14 sham; 10 males, 22 females; 23.1 ± 2.5 years of age). The sentence completion task was programmed using E-Prime software (Psychology Software Tools) and was based on the task used by Moberget et al. (2014). After initial instructions (30 s), participants viewed a series of four words presented sequentially, each for 750 ms. The first four words established the context for the fifth, target word, which was presented for 3000 ms with another word in a forced-choice paradigm. Participants were asked to choose the correct target word as quickly and as accurately as possible. The predictability of the final target word was manipulated by altering the context established by the previous four words. During predictive trials, the target word was highly predictable (e.g., “Two plus two is …”); during nonpredictive trials, the context formed by the initial four words was vague (e.g., “The man looked at …”). To control for the effects of visual stimuli and processes related to reading, we also included scrambled trials, during which the initial words did not establish any grammatically correct context for the target word (Fig. 1A). The experiment consisted of 20 trials (6 s per trial) for each condition (predictive, nonpredictive, and scrambled). Participants made all responses with their right hand. The position (right vs left) of the target word on the screen and the order of trials were randomized. The total run time was 6 min 30 s. Before task onset, participants were informed that “some sentences might make more sense than others, and other sentences might not make very much sense at all.” Participants were instructed to read all sentences and decide which of the two target words best completed the sentence formed by the previous four words as quickly and as accurately as possible, even in cases where the sentence did not make sense. Task schematic and tDCS electrode placement. A, The sentence completion task consisted of three conditions: predictive (left), nonpredictive (middle), and scrambled (right). B, tDCS electrode placement over the cerebellum rendered on the T1 MPRAGE of an individual subject. C, Timeline of data acquisition and tDCS administration. Predictive sentences were selected from a total of 164 possible predictive and nonpredictive sentences (scrambled sentences were not tested). Predictability was tested by anonymous survey in an independent group of 54 native English-speaking participants between the ages of 18 and 35 years using Amazon's Mechanical Turk population. Each participant provided informed consent and was reimbursed for their time. The survey was developed with Qualtrics Survey Software. Participants were asked to complete a sentence formed by four words with a fifth “target” word. Cloze probabilities were calculated for 78 of the 80 predictive and nonpredictive sentences included in this study (two sentences used in the task were unintentionally not included in the survey). Two sets of 40 sentences were created so that different sentences were used for the pre- and post-tDCS runs. We matched the two sets of sentences for cloze probability for the predictive (set 1 median cloze probability, 0.80; set 2, 0.77) and nonpredictive (set 1 median cloze probability, 0.04; set 2, 0.09) sentences. To avoid confusing participants with two possibly correct target choices, the two words presented in the majority of predictive and nonpredictive sentences were grammatically correct but were not semantically related to each other. tDCS was applied using the MR-compatible NeuroConn DC-Stimulator MR Plus (Jali Medical). tDCS is a transient neuromodulation technique that alters resting membrane potentials via electrodes on the scalp. Anodal tDCS depolarizes the resting membrane potential, resulting in “excitatory” effects on the underlying tissue that last for minutes to hours after stimulation, and these aftereffects are thought to be mediated by synaptic plasticity (Utz et al., 2010; Zaghi et al., 2010). Outside of the scanner, a 5 × 7 cm saline-soaked electrode pad was placed over the right posterolateral cerebellum, 1 cm down and 4 cm to the right of the inion (estimated to be over lobule VII; see Fig. 1B), with the reference electrode on the right clavicle. After the initial MPRAGE, task, and resting-state scans were completed, anodal current was ramped up to 1.5 mA over 15 s, applied for 20 min, and then ramped down over 15 s while participants were inside the scanner. In sham conditions, the current was ramped up and immediately ramped down at the beginning of 20 min. This allowed participants in the sham condition to experience the initial tingling sensation associated with tDCS without receiving enough stimulation to modulate neuronal excitability. Participants began the language task ∼7 min after cessation of tDCS, following the resting-state scan. After exiting the scanner, participants completed a post-tDCS questionnaire to assess symptoms both during and after tDCS administration (Fig. 1C). Neuroimaging was performed on a Magnetom Trio 3T scanner (Siemens) with a 12-channel head coil at the Center for Functional and Molecular Imaging, Georgetown University Medical Center. We acquired a high-resolution T1-weighted MPRAGE structural scan (parameters: sagittal acquisition, TR/TE 1900/2.52 ms, FoV 250, 1 mm thickness with 18% oversampling, creating 1 mm3 voxels). Both pre- and post-tDCS, BOLD EPI images were acquired during the sentence completion task (parameters: 57 interleaved slices, 122 volumes, TR/TE 3000/30 ms, 3.2 mm3 isotropic voxels, total run time 6 min 6 s). We also acquired resting-state EPI data both before and after tDCS (parameters: 38 interleaved slices, 168 volumes, TR/TE 2500/30 ms, FoV 64 × 64 mm, 3.2 mm3 voxels, total run time 7 min). Resting-state data were also collected during the 20 min of tDCS administration but were not the focus of this study; these data will be reported elsewhere. Participants were instructed to close their eyes and clear their heads of any particular thoughts during the resting-state scan. Data analysis: preprocessing of task-related neuroimaging data. SPM8 was used for data preprocessing and statistical modeling. Images from both runs (pre- and post-tDCS) were preprocessed using a standard pipeline, which included the following: removal of the first two scans, slice-time correction, realignment, coregistration to subject's T1 image, segmentation, normalization to MNI space, and smoothing (6 mm FWHM). fMRI data from one participant failed to normalize using their T1 scan and were therefore normalized using the EPI template. First-level analyses were conducted for each participant, including realignment motion estimates as covariates of no interest. The default brightness threshold (defaults.mask.thresh) in SPM was changed from 0.8 to −Inf to avoid signal dropouts in the cerebellar hemispheres and deep cerebellar nuclei, and an explicit whole-brain mask was set during model specification (Thürling et al., 2012). At the first level, activation associated with building the predictive model was assessed by modeling the BOLD signal during the four context words (first 3000 ms of each trial). As our goal was to assess the presence of internal models without the confounds of signal related to the motor response, we excluded time points associated with responses to the target word (final 3000 ms of each trial). Given the large inherent variability across different imaging analyses (rsfMRI, fMRI) and the subtle differences in some of our contrasts of interest, we used thresholds that were appropriate to each analysis in question. We applied a strict threshold (p < 0.001, FWE cluster-corrected p < 0.01) for comparisons in which we expected a large effect size (e.g., pre-tDCS predictive sentence activation vs implicit baseline; pre-tDCS rsfMRI). We made use of a more liberal voxel-level threshold (p < 0.005) for comparisons with small expected effect sizes, such as our subtle contrasts of interest (e.g., pre-tDCS predictive vs nonpredictive sentences; predictive anodal [post > pre] > predictive sham [post > pre]). This more liberal threshold for the subtle comparisons is consistent with previous literature examining semantic processing (Moberget et al., 2014; Weber et al., 2016) but may limit our control of false positives (Eklund et al., 2016). Pre-tDCS, we combined the first-level data from both anodal and sham participants for second-level analyses. For all participants, we performed a conjunction analysis to assess regions associated with semantic processing across all three conditions (p < 0.001, FWE cluster-corrected p < 0.01). We then examined the effects of sentence type (predictive, nonpredictive, and scrambled vs implicit baseline) on activation patterns (p < 0.001, FWE cluster-corrected p < 0.01). Next, to examine the specific effects of level of prediction, we created contrasts comparing each sentence type (predictive vs nonpredictive, predictive vs scrambled, nonpredictive vs scrambled). Both directions were tested for each contrast (i.e., predictive > scrambled as well as scrambled > predictive). Activation patterns were highly similar between conditions due to the subtle nature of the sentence type manipulation; therefore, we applied the more liberal threshold to these between-condition comparisons (uncorrected p < 0.005, k = 10). At the first level, post-tDCS minus pre-tDCS (post-tDCS > pre-tDCS) contrasts were created for each participant based on a within-subject design. We entered these first-level contrasts (post-tDCS > pre-tDCS) into a second-level full factorial model enabling the comparison of anodal versus sham tDCS groups both across and within all three task conditions (predictive, nonpredictive, scrambled). The liberal threshold was applied to these comparisons (uncorrected p < 0.005, k = 10). Resting-state functional connectivity (rsFC) analysis. Image preprocessing and statistical modeling for resting-state data were performed using the CONN toolbox (version 15e) implemented in MATLAB 2015 (Whitfield-Gabrieli and Nieto-Castanon, 2012) (http://www.nitrc.org/projects/conn). Resting-state functional scans for each subject were preprocessed in a standard pipeline, including the following: slice-time correction, realignment, and unwarping; ART scrubbing for outlier detection using default thresholds in CONN; normalization; and smoothing (8 mm FWHM). After preprocessing, all images were bandpass filtered (0.01–0.09 Hz). Subject-specific nuisance variables included head motion parameters from realignment, white matter signal, and CSF signal. Time-series predictors of global signal were removed following the CompCor strategy as implemented in the CONN toolbox (Behzadi et al., 2007), allowing for the interpretation of anticorrelations (Murphy et al., 2009). Seed-to-voxel analyses were conducted using ROIs as described below. Functional ROIs were created from the most statistically significant voxels from the pre-tDCS semantic predictive processing fMRI analysis (defined using a voxel-level threshold of FWE p < 0.05, k = 50; whole-group activation patterns for the predictive condition vs implicit baseline). 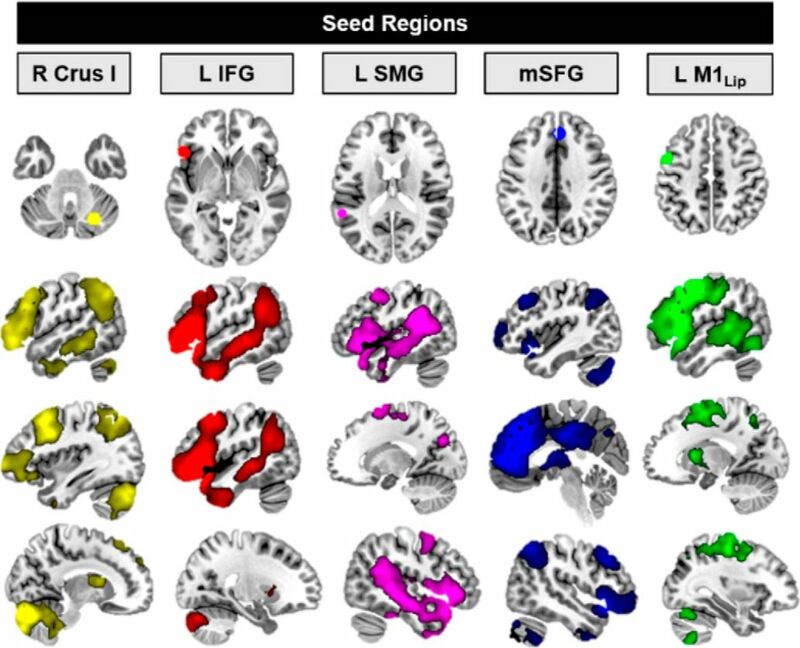 These clusters (right Crus I, left IFG, left pSTG/SMG, left SFG, and the left lip representation in primary motor cortex/primary somatosensory cortex) represent core regions of the reading and language network. Spherical ROIs (8 mm radius) centered on the peak voxels were created in MARSBAR (Brett et al., 2002), and input into the CONN toolbox as seed regions for rsFC analysis. Pre-tDCS, we combined the anodal and sham groups and examined rsFC from all five seeds. Post-tDCS, the rsfMRI analysis mirrored the fMRI analysis. Within-subjects, post-tDCS minus pre-tDCS (post-tDCS > pre-tDCS) rsfMRI maps were created from each of our seeds. 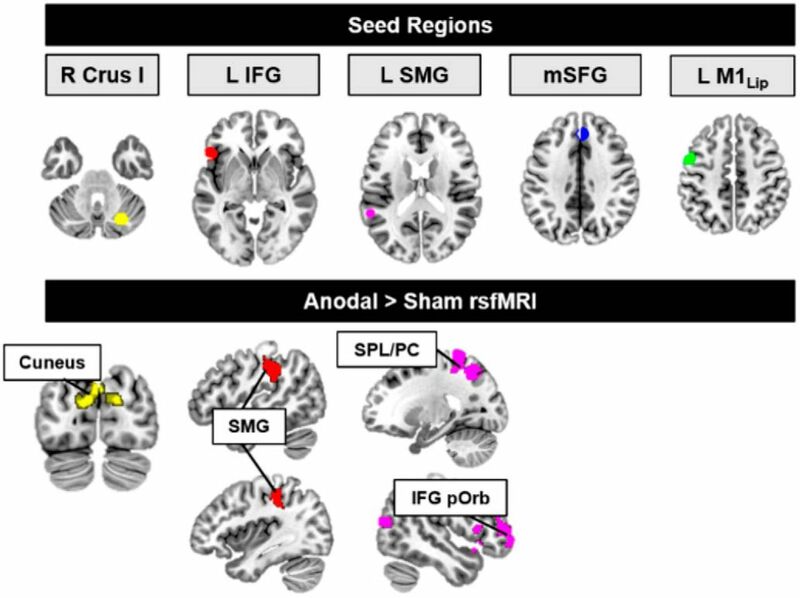 These maps were brought up to the second level to examine between-group differences in rsfMRI from each seed (Anodal [post > pre] > Sham [post > pre]). All analyses were thresholded at the liberal voxel-level p < 0.005, with an additional FWE p < 0.01 cluster correction. We examined accuracy and response time (RT) data during task performance. For the behavioral analysis, three participants were excluded due to incomplete data as a result of scanner button box malfunction. Accuracy scores were determined for the predictive and nonpredictive sentences; as there were no “correct” answers for the scrambled condition, we did not calculate accuracy scores for scrambled sentences. For RT data, we eliminated any incorrect trials and trials in which the RT was <200 ms. We also eliminated outlier values for each participant, defined as RTs >2 SD from the participant's mean RT. Data were log-transformed due to lack of normally distributed RT data. For accuracy data, a mixed-factorial ANOVA was used to examine the effects of time point (pre-tDCS, post-tDCS), sentence condition (predictive, nonpredictive), and group (anodal, sham). For RT data, a mixed-factorial ANOVA was conducted to examine the effects of time point (pre-tDCS, post-tDCS), sentence condition (predictive, nonpredictive, scrambled), and group (anodal, sham). Following the scanning session, participants completed a 26 item self-scored questionnaire to rate side effects both during and after tDCS, such as tingling, itching, burning, attention, fatigue, and pain (Kessler et al., 2012). Participants rated the extent to which they experienced these symptoms on a scale of 0 (not at all) to 10 (greatest imaginable). Between-group (anodal vs sham) differences in symptoms were analyzed using two-sample t tests. We ran a mixed-factorial ANOVA to analyze log-transformed RT data with two within-subjects factors (time point [pre-tDCS, post-tDCS] and sentence condition [predictive, nonpredictive, scrambled]), and one between-subjects factor (group [anodal, sham]). Greenhouse-Geisser corrected p values were used due to violations of sphericity. There were no significant effects of tDCS group on RTs. There was a main effect of sentence condition (Table 1; F(1.087,29.339) = 92.376, p < 0.001), with participants completing the predictive sentences more quickly than the nonpredictive sentences (post hoc t test p = 1.5 × 10−19), and participants were slowest to complete the scrambled sentences (post hoc t test predictive vs scrambled, p = 4.9 × 10−12; nonpredictive vs scrambled, p = 2 × 10−6). The finding that participants answered significantly more slowly in the scrambled trials (900–1100 ms) compared with the predictive trials (400–600 ms) implies that participants attempted to make sense of the scrambled sentences, despite the lack of grammatical structure. There was also a significant sentence condition × time point interaction (F(1.432,38.666) = 14.505; p = 0.001), revealing a practice effect in certain task conditions. Post hoc t tests revealed that participants responded significantly faster during nonpredictive sentences the second time they performed the task (post-tDCS) (t = 10.08, p < 0.001). We ran similar mixed-factorial ANOVA to analyze accuracy data for the predictive and nonpredictive sentences. The scrambled condition was not analyzed, as there were no correct answers for the scrambled sentences. There were no significant main effects of condition (predictive, nonpredictive) or time-point (pre-tDCS, post-tDCS), and no significant interactions (for accuracy data, see Table 1). There were no statistically significant differences between groups (anodal, sham) for any of the 26 symptoms on the questionnaire either during or post-tDCS. On average, highest symptom scores were reported for “tingling” during tDCS (sham μ = 2.2; anodal μ = 3.8; uncorrected p = 0.06) and for “fatigue” post-tDCS (sham μ = 1.3; anodal μ = 0.9; uncorrected p = 0.36). The questionnaire data indicate that the tDCS did not cause different symptoms in the anodal and sham groups that might impact interpretation of brain activation differences between groups. Conjunction analyses across all task conditions (predictive, nonpredictive, and scrambled) showed activation of a common network of regions, including the left IFG, bilateral MTG/superior temporal sulcus, angular gyrus, fusiform gyrus, and right lobules VI/Crus I/Crus II of the cerebellum (Fig. 2; Table 2). Within the cerebellum, right lobules VI/Crus I/Crus II were activated more than homologous left cerebellar hemisphere regions, mirroring the more left-lateralized activation patterns within the cerebral cortex. Sentence completion activates the reading and language network. A, Cerebellar results of conjunction analysis across the three task conditions (predictive, nonpredictive, and scrambled) show activation of left VI/Crus I and right lobules VI/Crus I/Crus II. B, Cerebellar activation during sentence processing is concurrent with supratentorial activation in the reading and language network. C, Individual task conditions activate slightly different regions of the cerebellum, with convergence in lobules VI/Crus I/Crus II. AG, Angular gyrus; IPL, inferior parietal lobule; ITG, inferior temporal gyrus; M1, primary motor cortex; mSFG, medial superior frontal gyrus; MTG, middle temporal gyrus; pOper, pars opercularis; pOrb, pars orbitalis; pTri, pars triangularis; S1, primary somatosensory cortex; SMG, supramarginal gyrus; STS, superior temporal sulcus. To specifically assess internal model formation and predictive processing, we directly compared whole-brain activation patterns between the task conditions. Compared with nonpredictive trials, predictive trials increased activation in a focal region of right lobule VII (VIIB/Crus I/Crus II) of the cerebellum (Fig. 3; Table 3), as well as in cerebral cortical regions typically involved in predictive and semantic language processing, including the IFG, MTG, and precuneus (Price, 2012; Moberget et al., 2014; Willems et al., 2016) (Fig. 3). Only the predictive > nonpredictive contrast showed differential cerebellar activation. Predictive processing enhances activation in the cerebellum. Increased activation was noted for predictive vs nonpredictive sentences. There were no cerebellar differences for any other contrasts. Data are thresholded at p < 0.005, k = 10. CrI/CrII, Crus I/Crus II; IPL, inferior parietal lobule; pMTG, posterior middle temporal gyrus; pOper, pars opercularis; pTri, pars triangularis; SMA, supplementary motor area. We conducted a seed-to-voxel rsFC analysis using the right Crus I cluster active during predictive sentences as a seed (functional ROI created from the peak pre-tDCS activation; for seed locations, see Fig. 4, top). Before tDCS, this right Crus I seed showed strong functional connectivity with cerebral cortical regions important for language and reading, including the IFG, left middle frontal gyrus, left precuneus, and bilateral angular gyrus (Fig. 4; Table 4). While functional connectivity patterns were bilateral, there was also evidence of the predicted robust contralateral connectivity between the right cerebellum and left cerebral cortical regions. Pre-tDCS rsFC from language network seeds. Functional seeds (top row) were functionally connected with distributed regions in the reading and language network (bottom three rows). We hypothesized that tDCS to the cerebellum would show unique patterns of activation during semantic prediction, compared with nonpredictive or scrambled sentences. Within-subject post- vs pre-tDCS contrasts were brought up to the second level to assess group (anodal vs sham) differences within each condition. Compared with sham tDCS, anodal tDCS increased activation within right lobule VI/Crus I during predictive sentences, overlapping with the activation patterns associated with predictive processing before tDCS. Therefore, anodal tDCS increased activation in a right-lateralized, focal cerebellar cluster (MNI 36, −55, −28, k = 23, t = 3.78, p = 1.4 × 10−4; Fig. 5). No differences in cerebellar activation were noted between the anodal and sham groups during nonpredictive or scrambled sentence processing. Anodal tDCS increased activation in right Crus I/II of the cerebellum during predictive processing. Post-tDCS, during predictive sentences, the anodal group had increased activation in right VI/Crus I (cyan) in a cluster that overlapped with pre-tDCS predictive processing regions in the cerebellum. Cerebellar tDCS modulated rsFC patterns between reading and language regions and several areas previously implicated in semantic retrieval. Compared with sham tDCS, anodal tDCS increased rsFC between the main nodes of the predictive reading and language network (Fig. 6). Specifically, anodal tDCS increased rsFC between right Crus I and the left cuneus (MNI −8, −78, 24, k = 981, p = 1 × 10−6, FWE cluster p = 0.00005), which has been implicated in language learning (Callan et al., 2003). Functional connectivity also was increased between the IFG seed and the left supramarginal gyrus (MNI −48, −38, 36, k = 629, p = 4 × 10−5, FWE cluster p = 0.003); and between the pSTG/SMG seed and the right IFG (MNI −50, 54, 0, k = 982, p = 2 × 10−6, FWE cluster p = 0.00009), the left superior parietal lobe/precuneus (MNI −22, −48, 66, k = 949, p = 2 × 10−6, FWE cluster p = 0.0001), and the right middle occipital cortex/MTG (MNI 26, −78, 16, k = 531, p = 0.0001, FWE cluster p = 0.008). There were no differences in rsFC between the anodal and sham groups before tDCS administration. Pre- to post-tDCS connectivity changes from the SFG and primary motor cortex lip area seeds did not differ between the anodal and sham groups. Cerebellar tDCS modulates resting-state networks. Anodal tDCS increased rsFC between nodes of the predictive language network and regions implicated in second language learning, and syntactic and semantic language processing (Binder et al., 2009; Price, 2012). Top, Seeds from predictive language nodes, identified in the pre-tDCS data. Bottom, Anodal (post > pre) > Sham (post > pre) rsFC (p < 0.005, cluster-corrected FWE < 0.01). No changes in rsFC were noted for the SFG or the primary motor cortex lip representation seeds. M1, Primary motor cortex; mSFG, medial superior frontal gyrus; pOrb, pars orbitalis; PC, precuneus; SMG, supramarginal gyrus; SPL, superior parietal lobule. We combined tDCS and fMRI to assess the hypothesis that the cerebellum forms linguistic internal models that are used during semantic prediction. As expected, right cerebellar lobules VI and VII were active during sentence completion. Specifically, increased activation in right Crus I/II was evident during semantic prediction, and right posterolateral cerebellar tDCS modulated BOLD activation patterns only during predictive sentences. Last, tDCS increased functional connectivity between nodes of the predictive reading/language network and regions involved in second language learning (Callan et al., 2003), and syntactic and semantic processing (Binder et al., 2009; Price, 2012; Jackson et al., 2016). These data provide further evidence that the cerebellum is sensitive to semantic information, shows focal activation patterns during semantic prediction, and is interconnected with language networks. During sentence completion, right lobule VI/Crus I/II of the cerebellum was activated in concert with a large network of supratentorial regions involved in reading and language processing, including the bilateral MTG and IFG, and showed strong functional connectivity with important nodes within these networks, including the left IFG. These results are consistent with a large body of literature indicating that the cerebellum is part of whole-brain language networks (Price, 2012), is active during a variety of reading and language tasks (Stoodley and Schmahmann, 2009; Stoodley et al., 2012; Keren-Happuch et al., 2014; Mariën et al., 2014), and that the degree of rightward lateralization in the cerebellum is associated with better core language skills (Berl et al., 2014). Our findings also support and extend previous studies showing that right lobules VI/Crus I/II are engaged during many types of semantic processing (e.g., Xiang et al., 2003; Price, 2012; Addis et al., 2016; Lopes et al., 2016). Broadly speaking, our results add to a growing literature supporting a role for the cerebellum in language processing. More specifically, evidence from both motor and cognitive tasks suggests that the cerebellum is involved in prediction, timing, and error monitoring (Ito, 2006). These ideas are consistent with the hypothesis that the cerebellum builds internal models that are trained by feedback errors and subsequently can be used for implicit prediction of future events, leading to optimized, automatic performance (Courchesne, 1997; Ito, 2008; Miall and King, 2008; Ghajar and Ivry, 2009). Reflecting this, in clinical reports, cerebellar patients state that they must consciously control aspects of performance that were previously automatic. The extensive connections between the cerebellum and various regions of the cerebral cortex, including language regions, enable a wide variety of information to be incorporated into cerebellar internal models to support movement, cognition, and behavior regulation (Ito, 2008). In language processing, it is possible that, via these connections, the cerebellum builds a linguistic internal model that is updated based on the semantic context, providing a state estimation to the cerebral cortex that is used to predict upcoming auditory or written information, enabling rapid comprehension and production of speech. Internal model creation is also relevant to language acquisition and second language learning, during which individuals must master new grammatical rules and lexico-semantic associations. Successful second-language acquisition is associated with increased gray matter in right Crus I/II of the cerebellum (Pliatsikas et al., 2014), and toddlers show increased posterolateral cerebellar activation compared with older children during speech perception (Redcay et al., 2008), providing further evidence that the cerebellum is involved in formation and usage of internal models for language. We found increased activation in right Crus I/II when participants processed highly predictive sentences compared with nonpredictive sentences. 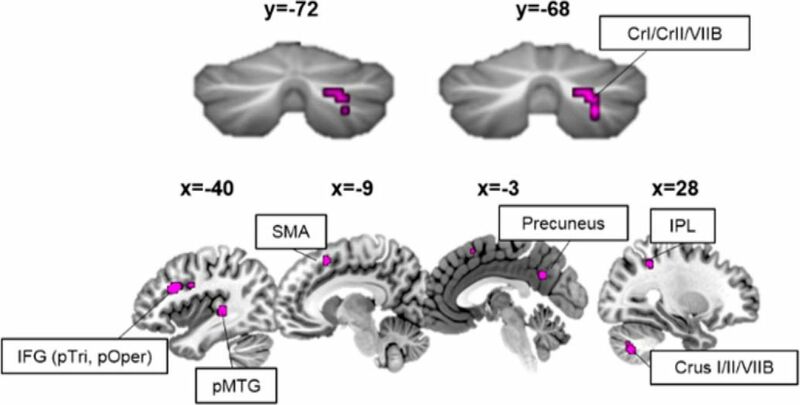 This activation was concurrent with activation in the posterior MTG, left IFG, and precuneus, regions implicated in semantic processing (Binder et al., 2009; Price, 2012; Jackson et al., 2016), and overlapped with clusters identified in previous fMRI studies of cerebellar activation during congruent sentence processing (Moberget et al., 2014). We also showed that tDCS modulated cerebellar BOLD signal only during sentences in which the context developed a strong semantic prediction. In behavioral studies, modulation of the posterolateral cerebellum via tDCS and TMS impacts the formation of linguistic internal models, with effects on predictive sentences but not nonpredictive sentences (Lesage et al., 2012; Miall et al., 2016; Runnqvist et al., 2016). The effect of neuromodulation on semantic prediction seems to be specific to lateral regions of lobule VII (Argyropoulos and Muggleton, 2013; Argyropoulos, 2016), distinct from cerebellar regions involved in articulatory control. Crucially, we report that cerebellar tDCS did not broadly increase activation throughout the brain: the effects of tDCS were focal to language-associated regions of the cerebellum and cerebral cortex. This is consistent with our previous work showing that cerebellar tDCS over the posterolateral cerebellum altered functional connectivity in cerebrocerebellar association networks but did not affect somatomotor networks (Turkeltaub et al., 2016). tDCS also increased rsFC between right Crus I and the cuneus, between the left IFG and the SMG, and between the left SMG and the left precuneus and right IFG. Increased connectivity between these regions might facilitate formation and usage of internal models for sentence processing. While we examined semantic prediction, it is possible that cerebellar right Crus I/II might form linguistic internal models across different tasks and modalities (e.g., written and spoken language). The cerebellar semantic prediction cluster in right Crus I/II in the current study overlapped with a cluster of activation found in a recent auditory adaptation study (Guediche et al., 2015), which found increased activation in this region during attempts to decode degraded linguistic stimuli (monosyllabic words). More accurate predictions of degraded stimuli were associated with increased activation in right Crus I/II. Likewise, tDCS to right cerebellar lobule VII improved performance on a phonemic fluency task (Turkeltaub et al., 2016), suggesting that this region of the cerebellum might be involved in formation of internal models at multiple levels of language processing. Future research can assess whether different cerebellar subregions operate on linguistic information that varies in type (phonemic, syntactic, semantic) or timescale (phonemes vs sentences vs conversations). The current study is not without its limitations. First, we found no behavioral effects of cerebellar tDCS administration on RTs or accuracy. Previous studies reported that cerebellar neuromodulation affected RTs during predictive language processing. However, these studies used eye tracking and other techniques to assess very small reaction time changes (Lesage et al., 2012; Miall et al., 2016). Our lack of behavioral effect is consistent with a large quantitative review reporting no reliable behavioral effects of tDCS across a variety of cognitive tasks (Horvath et al., 2015; though see criticism by Price and Hamilton, 2015). That said, in the current study, reaction times for predictive conditions were as fast as 400 ms, indicating a possible ceiling effect before tDCS, leaving little room for improvement. Further, previous examinations of tDCS efficacy across cognitive tasks did not include cerebellar tDCS (Horvath et al., 2015), and more recent meta-analyses have found robust effects of single-session tDCS on language tasks in particular (Price et al., 2015). Second, unlike previous predictive language fMRI paradigms, the current task did not include an “incongruent condition” during which the linguistic context was highly predictive of the target word, but the target word did not match this prediction (i.e., “Two plus two is apple”) (Moberget et al., 2014). Rather than incongruent sentences, here we tested sentences that were plausible yet nonpredictable; we were therefore unable to model “prediction errors” per se. Third, our tDCS protocol varied from that used in previous studies of semantic prediction, which applied tDCS during the task and placed the active electrode 1 cm down and 2 cm lateral to the inion, in a more medial location (Miall et al., 2016). Because activation associated with linguistic prediction tends to localize to lateral lobule VII, our active electrode was positioned over this region (1 cm down and 4 cm lateral to inion) (Pope and Miall, 2012). Future studies should examine the effects of differences in tasks, “online” versus “offline” effects of tDCS, and changes in electrode placement on cerebellar activation and behavioral performance. The current study indicates that cerebellar tDCS has the potential to modulate whole-brain networks supporting reading and language, and that the established contribution of the cerebellum to optimization and automatization of performance in the motor domain could potentially be expanded to improve language and literacy skills in clinical populations. tDCS is a noninvasive, inexpensive, and portable neuromodulation technique. Right posterolateral cerebellar tDCS might assist treatment of poststroke aphasia, which is associated with word finding and retrieval difficulties (Turkeltaub et al., 2016). Cerebellar abnormalities have been associated with developmental dyslexia (for review, see Stoodley, 2015), potentially resulting in impaired implicit acquisition of reading skills (Nicolson et al., 2001) or reduced reading speed (fluency) (Norton et al., 2015). Future studies in clinical populations will determine the therapeutic potential of cerebellar tDCS for patients with reading and language disorders. In conclusion, activation within the cerebellum was modulated by the predictability of linguistic information, and cerebellar neuromodulation impacted activation patterns only during predictive sentence processing. Further, cerebellar tDCS modulated rsFC within language networks. Together with prior studies, these findings support the hypothesis that the cerebellum is involved in the formation of internal models that are used in semantic prediction, consistent with the concept that the cerebellum contributes to the optimization of cognitive processes. These findings suggest that increased cerebellar activation and functional connectivity might hone circuits involved in semantic retrieval to better predict upcoming words. This work was supported by National Institutes of Health Grant R15MH106957 to C.J.S. and Grant R21DC014087 (Multi-PI Grant) to C.J.S. and P.E.T. We thank Caitlin Barrett, Brianne Drury, and Stephanie Martin for data collection. (2002) Region of interest analysis using an SPM toolbox. Presented at the 8th International Conference on Functional Mapping of the Human Brain, Sendai, Japan. (2015) The linguistic cerebellum. Waltham, MA: Academic. (2015) The role of the cerebellum in developmental dyslexia. In: The linguistic cerebellum (Marien P, Manto M, eds). Waltham, MA: Academic.